Your Brand, Our Technology 100% white label lead capture chatbots complete with our branded business text messaging app, local phone number, unlimited users, unlimited contacts, and enhanced customer data. The Starter Plan includes 500 text messages and 100 voice minutes per month. Customized for Your Business We’ll customize one of our industry specific Lead Capture Chatbot templates based on your business website, call to action and business goals. The Lead Capture Chatbot is fully integrated with our business text messaging app so there is no coding, setup or development required. Simply install one line of code to activate your custom lead capture chatbot on your website. Messaging, Not Forms With a Lead Capture Chatbot on your website, any conversation can be a conversion. Instead of traditional marketing and sales platforms that rely on forms and email follow-ups, our technology leverages messaging to build trust with visitors, gather contact information and deliver your business qualified leads in real-time, like a virtual assistant for your website. Appointment Booking Allow prospects to book appointments with you in real time. Sync the Lead Capture Chatbot with your Office 365 Calendar, Google Calendar or iCalendar to schedule calls and sales meeting in real time with new customers based on your personal calendar. 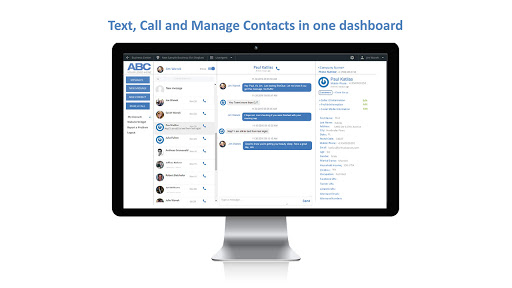 Intelligent Lead Routing Your Lead Capture Chatbot automatically gathers contact information, integrates with your CRM and routes new leads to your team so they can have personalized two-way text message and phone conversations using the white label messaging app and your dedicated local phone number. Enhanced Customer Data You can create better experiences for your customers and leads when you have more information about them. But when all you have is an email address, manually searching through LinkedIn and online databases can be exhausting. All you need is a lead’s mobile phone number to get enhanced customer data like their name, age, gender, address, email address, occupation, household income, social profile—among other useful information! AI Powered Live Chat + Website Text Messaging to reduce bounce and boost conversions. SiteGlue AI Powered Live Chat Agents + Website Text Messaging reduce bounce and boost conversions up to 40%! Our proven lead capture conversation flow engages visitors, asks qualifying questions and routes hot leads to your phone, email and CRM 24 hours a day, 7 days a week. Chatbot Starter includes a dedicated phone number and 500 text messages per month. The chatbot and dashboard is white-labeled. On average, 96% of website visitors leave without taking action. SiteGlue AI Powered Live Chat engage visitors, reduce bounce and route hot leads to your email, phone and CRM automatically. Our proven artificial intelligence lead capture conversation flow is designed to evaluate buyer intent so you only receive qualified leads from your website. Enable website text messaging and make it easy for new customers to send a text message from your website to your personal cell phone number or dedicated SiteGlue business phone number. Install the SiteGlue plugin for WordPress and customize the AI Powered Live Chat widget images and content to match your business branding. 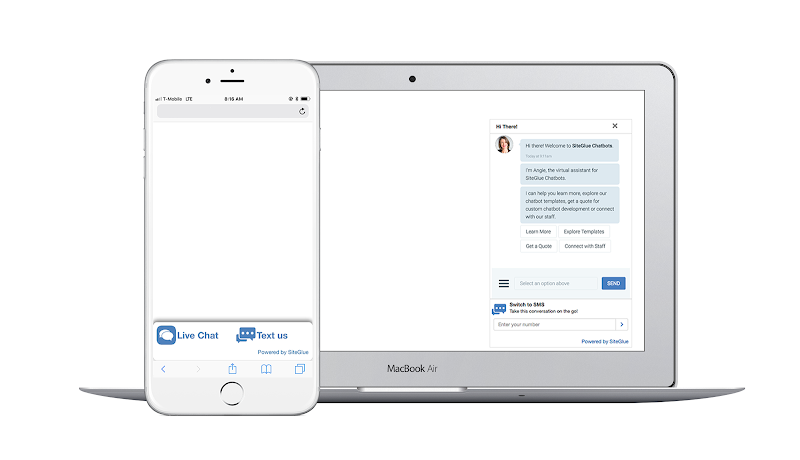 AI Powered Live Chat automatically qualifies leads, gathers contact information and routes hot leads to your staff so they can have personalized two-way text message and phone conversations using the messaging app and your dedicated local phone number. Order a custom chatbot for any business or industry not included in our standard, industry specific templates. Custom development work includes consultation with your client to determine conversation flow, custom Zapier webhooks and third party platform integration. AI Powered Live Chat and Website Text Messaging to boost conversions and capture new customers. Chatbot Pro includes a dedicated phone number and 1,500 text messages per month. The chatbot and dashboard is white-labeled. One fully researched and highly optimized blog post written with SEO best practices.